A lot’s been happening in recent weeks and months so we’ve pulled together some highlights and a look ahead for you. 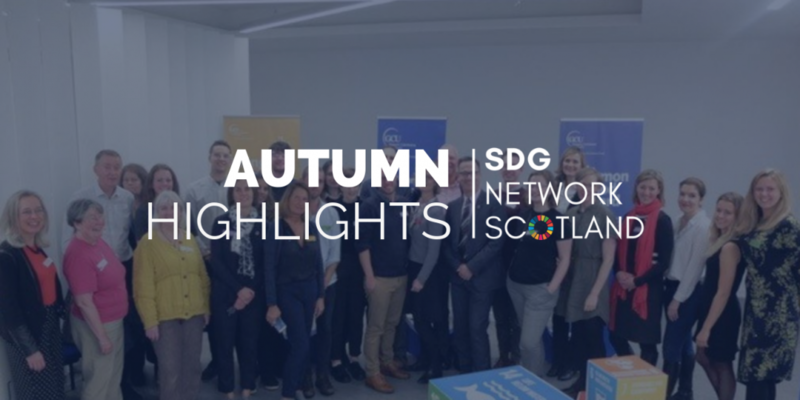 Last month saw Scotland’s SDG Network meet with both the UK and Scottish Governments, we set up an open working group to guide our approach to the National Review on SDG progress, and just this week the group – which includes Scottish Government – had its first face to face conversation in Edinburgh. We also received another mention in Parliament (small steps…). What’s been great has been the many different faces we’ve seen contribute, whether that be online to our SDG Briefing, in person at last month’s workshop or dedicating extra time on the working group. Organisations have been kind enough to offer meeting and event space and the Scottish Government are actively engaging with us on the forum, which has welcomed over 170 people since it was set up in May. None of this would be possible without your participation, so thank you! We’d love to know what else you are up to so please remember to share your news, events and updates anytime on the SDG Network’s forum. 10 members stepped forward to take part in the Network’s open working group on the upcoming Voluntary National Review. The group – including Scottish Government – met this week to discuss plans for the review and collaboration, participation and openness were central to discussions. More info about the group, notes and next steps will be shared soon. For now, view our online discussions in this thread. Roughly 35 people turned up for the Network’s workshop with the Scottish and UK Governments in mid-October. Thanks to Glasgow Caledonian University and members of the Network, we were able to work quickly to put on an event that saw the UK Government’s first public engagement on SDGs with the devolved nations. We are in regular contact with groups in England, Wales and I’m hoping soon Northern Ireland to form better links across the four nations. Notes from the session can viewed here. At the end of August, the SDG Network partnered up with the Scotland Malawi Partnership and Scotland’s International Development Alliance to host a panel discussion with input from Dr Graeme Long of Newcastle University, the Scottish Government and the UN. The event marked the start of our activity after the summer break and a number of attendees have since joined the Network – welcome! There’s a growing interest in the SDGs from Scottish business and I recently joined a panel discussion in Edinburgh hosted by UN Global Compact UK on making the Global Goals local business – watch the event video here. On the same day, The Institute of Chartered Accountants of Scotland (ICAS) and Scottish Environment Protection Agency (SEPA) launched their SDG Reporting Working Group and a number of SDG Network members are involved in this initiative which is not limited to businesses – read their latest blog here. DFID (UK Govt) are inviting people to submit their responses telling them what you or your organisation is doing, to help the UK deliver the SDGs. DFID would like to showcase several examples of the great work being done across the country by different groups. You can submit your response by filling in this form. You can also email this form to sdgs@dfid.gov.uk by 11 January 2019. Please note Scotland’s SDG Network are also working closely with the Scottish Government’s Performance Team, who are leading this work in Scotland, to provide those in Scotland further opportunities to share what is being done on the SDGs. An update will be shared soon. Amanda Heenan from Arc of Inclusion and Sam Tedcastle of Centre of Good Relations are co-delivering the Equality Good Relations Project. They plan to meet with stakeholders connected to the SCVO project that supports the SDG Network to explore existing relationships, and identify gaps in participation across the SDGs. Find out more here. SCVO are looking at options to further develop the Network with members. We held a Network meeting with Year of Young People Ambassadors in September to start this discussion and you can expect to hear more from us on this soon. Read my blog on this here. Members of the SDG Network have recently featured in the Scottish press writing about the SDGs. It’s not very often we see SDGs in the national news, and hopefully we can build on this in the future. Click on the names to read more – May, Fran, Catherine. Learning for Sustainability Scotland are hosting an event next week on engaging the press on the SDGs and sustainability issues. A Scottish SDGs eco-system – can you help? A number of conversations taking place are focused around how we create strong links between the various groups working on the SDGs or sustainability issues in Scotland, whether that’s us, the ICAS-SEPA working group, the Sustainable Scotland Network or another body. Much of this will rely on facilitating the sharing of information between us or joint activities to have further reach. If you know of another group in Scotland, please let me know so we can add this to our mapping.